If you've been checking out the coverage of this new zombie movie World War Z, you may have noticed the mentions here and there of Colson Whitehead's Zone One, also a zombie novel. Whitehead might be one of the few African American writers regularly mentioned in non-black contexts. You know I'm not making some silly "post race" claim here. Instead, what I'm indicating is that Whitehead and his book possess what's known as crossover appeal. June 20 - The New York Times: "It [World War Z] does not expand the tonal range of zombie fantasy, like Ruben Fleischer's 'Zombieland' or Colson Whitehead's novel 'Zone One.'" June 21 -- The Daily Beast: "Clear incursions have been launched over the literary barricades by Colson Whitehead’s Zone One, Rick Moody’s Four Fingers of Death, and Cormac McCarthy’s The Road (post-apocalyptic cannibals taken as nearly synonymous). They even got Jane Austen." June 21 - Nerdist: "In comparison to other, more intelligent zombie fare like The Walking Dead, Colson Whitehead’s Zone One, or even Ruben Fleischer’s Zombieland, director Marc Forster [director of World War Z] takes a bit of a step back." 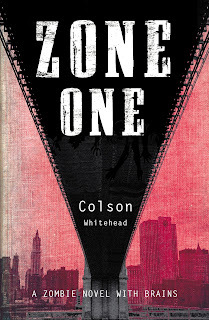 June 21 - Tor: "Colson Whitehead usually writes books that fall firmly in the 'literary fiction' aisle, but with Zone One he takes his beautiful way with prose and applies it to a post-post-zombocalypse story." June 24 - The Washington Post: "Bennett Sims’s brand new 'A Questionable Shape,' may be the smartest zombie novel since Colson Whitehead’s 'Zone One' (2011)." June 24 - Scholars and Rogues: "In a trailer scene reminiscent of Colson Whitehead's poignant Zone One (Anchor, 2011), zombies overrun an enormous wall."